Leicester City earned more money for reaching the Champions League quarter-finals last season than Real Madrid did for winning the competition. 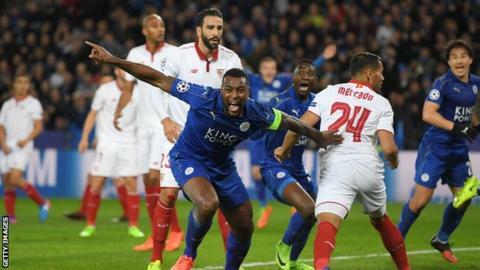 The Foxes, who were knocked out by Atletico Madrid, received 81.7m euros (£73.2m) in their debut season in the competition. Champions League winners Real Madrid were paid 81m euros (£72.6m). Runners-up Juventus were the only club to earn more with 110.4m euros (£98.6m). In total clubs taking part in the Champions League shared 1.396bn euros (£1.25bn) in payments from Uefa. Manchester United were paid 44.5m euros (£40m) for winning the Europa League - more than double any other club in last season's tournament. Arsenal, who fell to a 10-2 aggregate defeat to Bayern Munich in the last 16, were paid 64.6m euros (£58m). Manchester City, who came through the play-offs and lost to Monaco in the last 16, earned 50.2m euros (£45m), while Tottenham, who failed to get out of the group stages, received 43.2m euros (£39m). Celtic, who also failed to progress from their group, were paid 31.7m euros (£28m). Each club was guaranteed a minimum payment of 12.7m euros for participating in the group stage, while additional performance bonuses of 1.5m euros per win and 500,000 euros per draw. The 500,000 euros surplus for each drawn match was pooled and redistributed to all clubs taking part in the group stage in accordance with the number of wins they achieved. Further bonuses were paid for each knockout round reached: 6m euros for the round of 16, 6.5m euros for the quarter-finals, 7.5m euros for the semi-finals, 11m euros for the runners-up in the final and 15.5m euros for the winners. Monies from the market pool were divided according to the value of the TV deal in each country, among other factors.